This Friday (29th March) will be the last day of my placement at Glasgow Women’s Library and my last #FlashFictionFriday. It will seem strange not journeying through to Glasgow every Friday once it’s over. I’m looking forward, this week, to reading the submissions prompted by the current image (below) and to preparing a #FFF file with additional images so that the project can be continued or resurrected by others at any time after my departure. This blog will be brief because much of what I have to say will now find its way into the impending reflective essay. However, as many of you will know, I’ve enjoyed this project and am glad that I had the chance to engage with it. It promised to be an inspiring couple of days. I hope you can catch some of it. 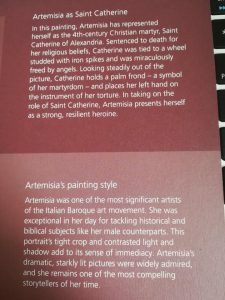 Artemisia has arrived in Glasgow. 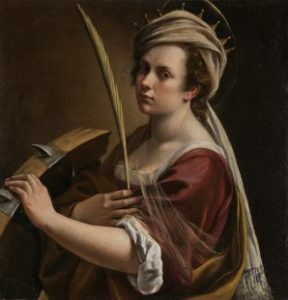 Artemisia Gentileschi’s self portrait as Saint Catherine of Alexandria is on tour from the National Gallery and has popped up at Glasgow Women’s Library. Here she is. Isn’t she beautiful? Get writing, get tweeting, what have you got to lose? If you are in or around Glasgow before 19th March – come on in and meet her! Our opening hours are 9.30am-5pm on Monday, Tuesday, Wednesday, and Friday and 9.30am-7.30pm on Thursday. We are also open on Saturday from 12pm to 4pm. #FFF – tip of the iceberg. 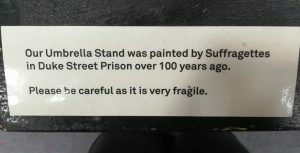 This week sees a slight departure from the prompts sourced from the GWL archive in that I have used an image of the umbrella stand, reputedly painted by Suffragettes in Duke Street Prison, Glasgow. 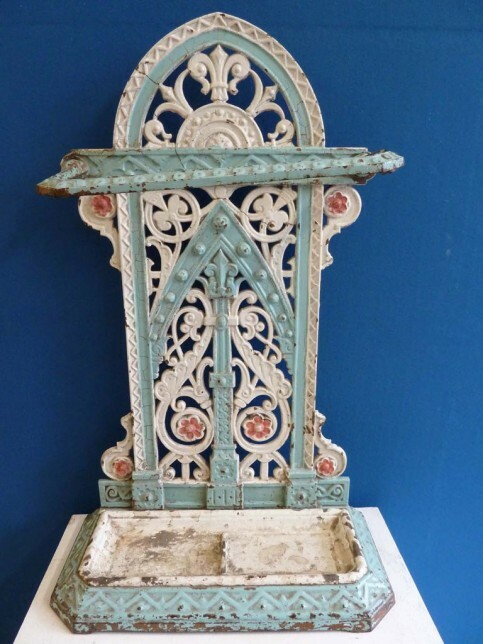 The umbrella stand sits proudly displayed within the library so many users will already be familiar with it. 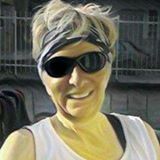 In the course of the past week I uncovered the analogy, attributed to Ernest Hemingway, of flash fiction being like an iceberg – only one tenth visible to the eye and above the surface with nine tenths lurking, unseen, beneath it. This seemed to fit perfectly with the tips I have been giving about being brief but hinting at a much larger backstory. 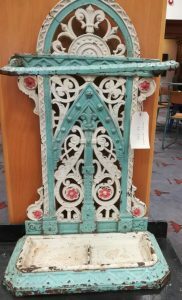 I have now used the analogy in my GWL website blog and in the tweeted guidance accompanying this image. This week I attended my second meeting of the “Open the Door” (women’s reading and writing festival) planning group. The festival promises to be excellent and I hope to attend as a participant in May. 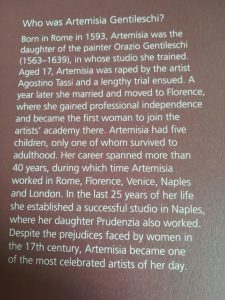 Next Friday will be exciting as it’s International Women’s Day (March 8th) The Decoding Inequality exhibition will already have been launched on the 6th March followed closely on 7th March by the start of the pop-up exhibition at the library of Artemisia Gentileschi’s Self Portrait as Saint Catherine of Alexandria, an oil painting from about 1615–17, as it makes its way on a ‘grand tour’ from the National Gallery, London. Eek – this week my trusty tech-mentor, Hannah, was taking some well earned leave and the technophobe was on her own! On the “to do” list was the blog on the GWL website about the four submissions received from week’s prompt and to introduce a new image as a flash fiction prompt for the coming week. Also, I was to tweet the new prompt. Unsurprisingly this took me most of the day but I have to admit to a sneeky smugness at crossing everything off the list. I hope the shiny, tiny stories above will have encouraged readers of this blog to have a go at a tweeted story. As usual, stories do not have to describe or be explicitly linked to the given image – the images are there simply to provide inspiration. Stories should fit into the format of a Tweet (or a series of linked Tweets) and be told in less than 240 characters! Remember to tag @womenslibrary! For those who do not tweet, stories can be e-mailed to info@womenslibrary.org.uk and identified as #FlashFiction Friday. Submissions should be made on or before Friday 22nd February and will subsequently appear on the GWL website. #FlashFictionFriday is open to all so get writing, tweeting and sharing with your friends! #FlashFictionFriday – here we go! During the day, three further submissions have appeared on the GWL Twitterfeed. I am overcome with excitement. Having done some more publicity via the website and Twitter today, the prompt will remain the one which appears below until next Friday 15th February. A compilation of the stories inspired by this prompt will then be published on the GWL website next week, at which point I shall choose a different image from the wonderful GWL archive to whet the creative appetite and inspire new submissions. As promised in my last post – #FlashFictionFriday is here! Thanks must go to the ever-patient and helpful Hannah who has actually uploaded it to the website and done all the techy bits. If you Tweet, please consider having a go at writing something. Or encourage your friends to submit a piece – the more submissions the merrier. If you don’t like the prompt, don’t worry – there’ll be another one along next week! 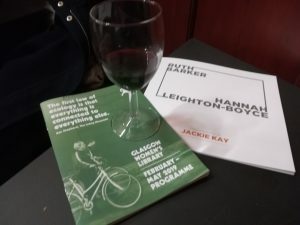 The new Glasgow Women’s Library Spring Programme was also launched yesterday and is packed with news of forthcoming activities, exhibitions and events, both in Glasgow and elsewhere in Scotland. Spring 2019 Programme Out Now! My first full day at Glasgow Women’s Library is in the bag! An interesting and varied day began with an introduction to the library, its history, value base, scope of projects, policy framework and overview of the team and who does what. Thankfully, I was also given a crash course in Twitter. I’ll be using this platform in coming weeks as a vehicle for the flash fiction project and I’m a rookie when it comes to the ways of the Tweet! It was fascinating to listen to discussion of ideas for the 2019 festival, which will take place on Friday 17th and Saturday 18th May. I’m already thinking I’d like to catch some of the literary action that weekend! I’ll post more details here as they are formalised. There will be an accompanying community learning programme, outreach handling resource and an online digital collection and interpretation resource. Friday 15th March sees the launch of the sectoral report at a Decoding Inequality event, sharing this equalities-led approach to object interpretation with museum and archive colleagues in the sector and beyond. My final activity for the day was to make a foray into the archive with Hannah to identify some objects which can be used as writing prompts for #FlashFictionFriday over the course of my placement. 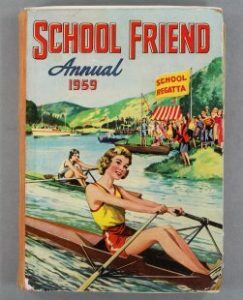 With limited time available today we unearthed a few possible items ranging from 1950’s annuals for girls to women’s roller-derby artefacts. Next week I hope to discover more intriguing materials to stimulate the creative imagination and to prepare the ground in readiness for our first flash fiction submissions . HO, HO, HO ….the festive season approaches and Semester 1 draws to an end. I have a hurried e-mail conversation with Hannah at Glasgow Women’s Library about my prospective internship in Semester 2. Let’s meet, we agree. Early in the new year before everything gets too busy. Brilliant. We put a date in the diary. I’m feeling very organised and it’s not even Christmas yet. With Twelfth Night behind us and Semester 2 looming ahead, we arrive in Laundressy Street and are made most welcome at the library. 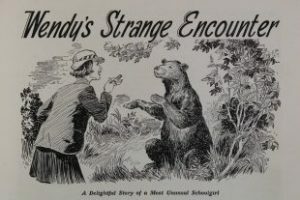 As my friend explores, I meet with Hannah to discuss the detail of the forthcoming internship. I shall spend the next ten Fridays here and my focus will be #FlashFictionFriday – encouraging women to submit short pieces of fiction online using prompts to be sourced from the library archive. This is great news and I try to contain the urge to babble with excitement. I don’t want to alarm Hannah. Instead, I focus on taking in the unique atmosphere here. The lending library consists mostly of donated books and free copies of significant texts blagged from publishers. The siren shelves sparkle with the stripey spines of Women’s Press Fiction and glow green with Virago Modern Classics. It feels comfortable and familiar and I want to stay all day, looking at books. But there is much more to see and discover about this space which celebrates the lives and achievements of women whilst championing their contribution to Scottish Culture. Hannah gives me an overview of the many projects undertaken by GWL – events, groups, activities, learning programmes, outreach projects but then asks if I would like to see the archive. And would my friend like to come along? I search for her and find her devouring information about Women’s Heritage Walks. We must come back and investigate some of these, she says. Waves of wonder and nostalgia sweep over us as Hannah guides us through the stacks, randomly opening boxes to reveal the treasures within. Members of the public donate much of the archive materials so there are are boxes of photographs and memorabilia relating both to individuals and to social, civic and community groups. Also here are complete back collections of feminist publications like Spare Rib and Harpies and Quines ( oh, the memories!….) 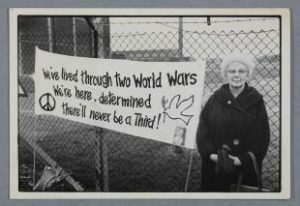 We look at some placards made recently by a group of female prison inmates as part of a women’s history project and spy a lone top-hat sitting on one of the shelves. “Oh…that’s Susan Calman’s hat from Strictly Come Dancing,” says Hannah, “Susan is a regular donor.” We are impressed. Do they ever refuse donations, we wonder? Hannah tells us they’ve had to politely turn away more knitting patterns as there is limited space to store them. My friend and I resist the urge to stay all day. We thank Hannah and I tell her with complete sincerity that I can’t wait to come back. We venture forth to search for lunch in Bridgeton. As we eat, we ask ourselves how a pair of ageing feminists have managed to avoid the lure of the Women’s Library for so long. We have no idea but agree that we’ll both be back.